Whether using a leather bound journal, a spiral notebook with kittens on the front, a Moleskine journal, or even an online journal, the beauty and therapeutic aspects of writing in a journal are amazing. My day is pretty predictable. I get up, I shower, I eat breakfast, I drink my coffee, I go to work, I come home, I make dinner, I help with homework, I read, I have an evening routine, then I sleep. At 5:30 am the next day I start it all over again. I'm an educator, an editor, a parent, and a partner. Each of those aspects of my life have certain requirements. They often have scenarios that aren't to my choosing nor are they ones I prefer. Sometimes they might even involve people I don't want to spend time with. When it comes to my journal, however, I have no protocols or restrictions. Nothing I write is taboo or "not allowed." My opinions rule. I get all my grievances out on paper as well as all of my ideas and thoughts. I also can ramble on without appearing to have a loose screw. On paper (or on the screen) it is exactly how I want it to be. For anyone who is a breathing human, we have millions of thoughts going through our head at any point in time. Some people are able to ignore many of their thoughts. Some people can organize their thoughts and keep a tight reign on them. Some people use meditation to help calm their "monkey mind." Some people, like me, just need to get my thoughts out of my head and down on paper. One of the reasons I still use a paper calendar is so I can write down everything in my schedule. My journal is where I can "think" through my thoughts. As thoughts enter my head, I write them down in my journal. I do a mental dump, if you will. (Check out 750words.com for an online "morning papers" journal.) Sometimes this way of writing helps me to find clarity. Sometimes it helps me discover a solution to a pickling problem. Sometimes I merely ramble with no rhyme or reason. Whatever the outcome, having these thoughts down on paper gives me peace of mind. It allows me to process my busy busy thoughts and think out loud. As each day passes, as the kids grow up, as I grow older, I have a tendency to reflect on my life. I reflect a lot. Sometimes I find a card tucked away on a shelf and I am immediately transported back to the time of the event. My mom saved some of my middle school journals for school and I can get lost in them for hours. In a journal, especially an online journal, you have a worded timeline. In some online programs, journal entries are even searchable. Whether using Penzu, 750words.com, Evernote, or paper journals, you can take a stroll down memory lane any time you desire. You can see how you have changed, how you have grown, what things were obstacles in the past, and what some of your plans were for the future. 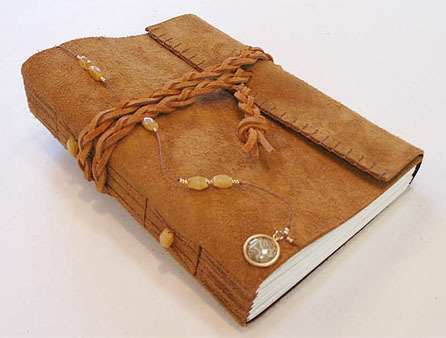 There have been occasions were my journal was a simple gratitude journal. Someday, perhaps, you might even share parts of your journal with offspring. When my grandmother passed on, I recall the joy my family had reading through her simple sentence-a-day-journal she kept when my grandpa was drafted for WWII. Being able to see where you have come from helps you plan where it is you want to go. For 2014, I am going to commit myself to 365 Days of Journaling. A journal entry, for me, is not going to have boundaries or limitations. It just needs to be an entry, made either in the morning or the evening (or both, if I'm feeling vocal) about the plans for the day [morning entry] or a rehash of the day that has passed [evening entry]. I am going to try to log it digitally, but if I don't have access to a computer, I will make the entry in my calendar. I am very excited about this Challenge. This is my first attempt at an action to be completed for the entire year. I have been writing every day for about two months as a "warm-up." I think I am very ready. After all, writing is something I have done most of my natural life! Have you ever tried a 365-Day challenge? If so, what was it and how did it go?